Now, in the controversy surrounding the April 12 arrest of two black men at a Philadelphia Starbucks, Sarsour's Women's March partner Tamika Mallory also is emerging as an anti-white, anti-Semitic voice whose real interest in the March seems to have been more about giving herself false legitimacy than any actual concern about the rights of women – at least, the rights of white and non-Muslim women. The situation in Philadelphia began with a phone call to the police by a Starbucks employee disturbed by the presence of the two men who had not ordered anything to eat or drink. Although they had caused no disturbance and were simply waiting to meet a friend, the two men were arrested within minutes. They were released from custody later that same evening. In a swift response to the apparently-racist incident, Starbucks CEO Kevin Johnson has pulled together a team of advisers to develop a curriculum for employees aimed at combatting "implicit" or "unconscious" bias. Among those called on to develop the program are Sherrilyn Ifill from the NAACP, Former Attorney General Eric Holder, and Jonathan Greenblatt, director of the Anti-Defamation League (ADL), one of the country's oldest and most-respected civil rights organizations. Or, that is, respected by some. Not, however, by Mallory, a proud supporter of Nation of Islam leader Louis Farrakhan. In fact, as the New York Daily News has pointed out, Mallory has called Farrakhan "the GOAT" – or Greatest of All Time. It's a somewhat unexpected accolade from a self-described rights activist to give to a man who has said that "White folks are going down," blamed Jews – whom he calls "the enemy of God and the righteous" – for black slavery and the 9/11 terrorist attacks, and in the storied anti-Semitic tradition, regularly claims that Jews "secretly" control the world economy. Over the years, he has also established ties with Arab and African despots such as Idi Amin and Muammar Gaddafi, who sent Farrakhan's Nation of Islam millions of dollars between the 1970s and 1990s, although American officials intervened to block a $1 billion offer to Farrakhan in 1996). And as a "special guest" to Iran, Farrakhan has met frequently with Iran president Hassan Rouhani. For these and more, the ADL proclaims him "America's Leading Anti-Semite." With heroes like this, it comes as little surprise that Mallory would rage against the ADL's participation in Starbucks' efforts to address racism. Jews, for Farrakhan – and presumably for Mallory – are the great oppressors and racists of all time, and the ADL, with its pro-Israel stance, is surely among the worst of them. And Sarsour stands beside her. Both women have repeatedly accused the ADL of sending "US police to Israel to learn their military practices," and of having a bias against blacks. Mallory also has accused the group of "attacks against Black Lives Matter." The implication: the ADL, as a pro-Israel Jewish group, is anti-black, anti-Muslim, anti-black civil rights, and supports attacks on blacks and Muslims in America. we [...] know that many of the concerns raised by participants in the Black Lives Matter movement are critical civil rights issues that merit attention. Police brutality, mass incarceration, racial profiling and the school-to-prison pipeline are legitimate topics of discussion both in an educational setting and in the larger community. That is why we have developed educational materials that encourage critical thinking skills among students tied to these and other current events. And it is why we continue to collaborate with other civil rights groups, law enforcement and government officials to address these societal issues. ADL is committed to fighting anti-Semitism and resisting bigotry in all forms as we seek to build the kind of society we all want to see for our children. True, the ADL does offer top police officials seminars in Israel, where "senior commanders in the Israeli Police and Israeli intelligence and security forces...share best practices and lessons learned in fighting terror." Such programs, however, are not uncommon; European police forces have received similar training with the NYPD post-9/11, for instance. But the focus in all cases is counterterrorism, not anti-Muslim or anti-black policing. Indeed, the ADL goes further. Crucial to its training program are two highly relevant courses: one on identifying white supremacy, and one titled, "Managing Implicit Bias for Law Enforcement," a course that encourages participants to "consider identity, culture, implicit bias, stereotyping and discrimination, and how these factors may affect their policing practices." Such courses have emerged from the ADL's historic concerns about the Holocaust and its pilot program, begun in 1999, that addresses "what can happen when law enforcement personnel do not uphold democratic principles." Yet it was just this – the failure of Philadelphia law enforcement to "uphold democratic principles" – that was responsible for the Starbucks incident, and it was the "implicit bias" of the Starbucks employee who brought the cops in in the first place. Contrary to claims by Mallory and Sarsour, then, there would seem no organization more suited to the task of ending racial bias than the ADL: so much so, that perhaps the two women might benefit from taking the course themselves. Instead, they have rallied allies to their anti-Jewish cause, including the ironically named Jewish Voice For Peace (JVP), a far-left, anti-Israel organization that actively supports the Boycott, Divest and Sanction (BDS) movement and has expressed admiration for terrorist bomber Rasmieh Odeh. Not coincidentally, the ADL has written a scathing report on JVP, noting that the organization has partnered with "anti-Israel organizations that deny Israel's right to exist...[and] consistently cosponsored demonstrations to oppose Israeli military policy that have been marked by signs comparing Israel to Nazi Germany and slogans that voice support for groups like Hamas and Hezbollah. JVP has not condemned or sought to distance itself form these messages." JVP's director, Rebecca Vilkomerson, has also consistently expressed her support of Mallory and Sarsour, whom she has called a "passionate and compelling, very smart, committed and an impressive person." And like them, she has accused the ADL of "anti-Muslim advocacy" and "profound insensitivity toward Black [sic] communities" – an allegation likely to surprise the NAACP, which has worked closely with the ADL for decades. Sadly, despite this conspicuous lapse in genuine support for human rights and equality, and despite the loud anti-Semitic activism, the rest of the Women's March team has stayed silent even as a petition circulates demanding Sarsour and Mallory resign from the board. The petition also seeks the resignation of Carmen Perez, another board member with ties to Farrakhan. "I want the Women's March to survive and succeed," petition author and Brooklyn, N.Y. photographer Tali Goldsheft, told Haaretz, "... [but] if these three women can attend Farrakhan's rallies and cheer him on, they shouldn't be leading a social justice movement." This is precisely the point. And it is the problem that now plagues so many who have cheered the Women's March as a movement. Moreover, in leading the project, all three of these women have tricked supporters into giving them credibility and legitimacy when they in fact have none. Through such insidious maneuvers, Sarsour and Farrakhan, like the Muslim Brotherhood-affiliated Council on American-Islamic Relations (CAIR) and others, have pulled a page from the radical Islam handbook. It is the same page followed, too, by Hamas, which has garnered international recognition and even support through its social welfare efforts even while it functions as a terrorist organization. Such trickery has no place in the Women's March campaign. Neither do the echoes of radical Islamist Jew-hate and divisiveness. 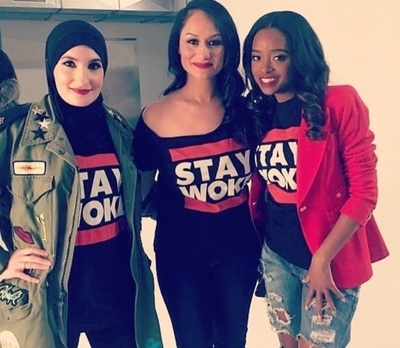 For the hundreds of thousands who marched, and the millions who supported the movement with their wallets and their hearts, the actions and words of Sarsour, Mallory, and Perez have come as a betrayal. We may continue to follow the movement. But we will not follow their leaders.